Ein-Zimmer-Hand behauenen Scheune auf Bach gelegen, mit Blick auf Teich. Gourmet-Küche mit Viking Herd & Gewächshaus-Fenster. Freiform-Deck. Im Erdgeschoss Schlafzimmer verfügt über eine Jacuzzi-Wanne und Dusche für 2 Personen. Dies ist zweistöckige Häuschen mit kleinen Wendeltreppe Schlafzimmer im Erdgeschoss zu gelangen. Sitzt auf landschaftlich 6 acre Teich und bietet eine atemberaubende Aussicht. Nahe Zentren wie Bromley Mountain, Zauberberg Okemo und StrattonMountain Ski. Nur 10 Minuten vom Stadtzentrum von Manchester und alle Shopping-Outlets. Haustiere sind, je nach Tier gestattet. 2 Kamine, Jacuzzi-Wanne und Dusche für 2, DSS Satelliten-TV, CD professionell für Sound verdrahtet; Lodgepole Möbel. The Honeymoon Cottage is such a peaceful retreat. It was so charming and serene and the perfect place for our little get away. The cottage itself was so lovely and you could feel the care that was put into creating the property. Thank you so much for the perfect relaxing weekend. We are already trying to make time for a return visit! The pictures do not do the cabin justice. It is very cool and cozy. The bed is one of the most comfortable beds I’ve slept in. Will definitely be back! Fantastic escape in a lovely home. I went skiing at Bromley and relaxed in the large tub afterwards. The owners are absolutely wonderful. We lit the fireplace and sipped wine. The only change that would improve this rental would be a couple of comfy couches or overstuffed chairs in the living room. We made do by hanging out on the very comfortable bed, reading and watching movies. The WiFi works great by the way. The wood beams are charming and the stairway down to the bedroom and one bathroom is beautiful, although not conducive to anyone who is unsteady on their feet. I will definitely be back. Thanks so much. We loved the Honeymoon Cottage. It was the perfect size for us and was nestled on its own drive. It made it seem like we were in the middle of nowhere, in a good way. But it was actually really close to the Manchester shops and restaurants. There was a big snow storm while we were there (16 inches of snow), but we never lost power and the plow came down the driveway right away. We were out and enjoying the snow the next morning no problem. 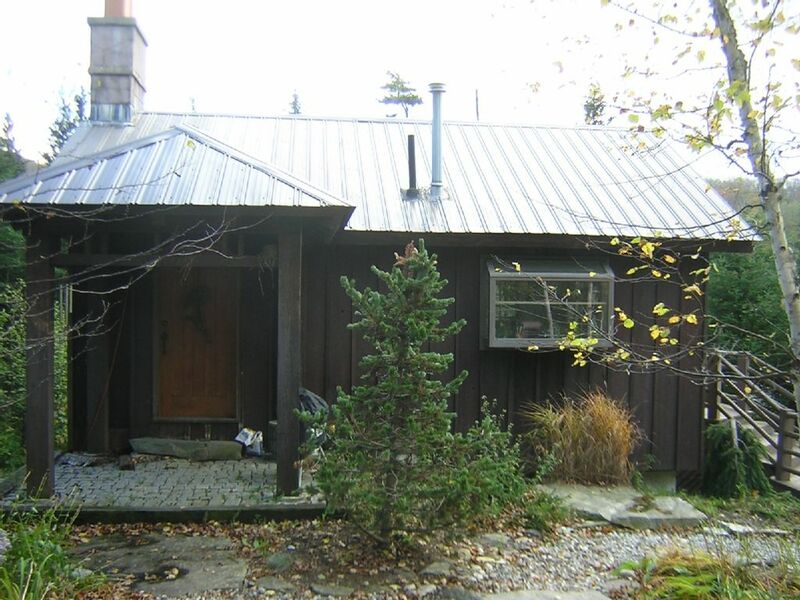 The cottage has a great sized kitchen and appliances, a dining room table, and two cozy rustic chairs in the living room. The bedroom and bathroom downstairs were amazing and the washer and dryer were definitely a treat to have. The only downsides were there was no couch to lay on and the spiral staircase to the bedroom, while really unique and gorgeous, was very slippery if just wearing socks, so keep that in mind. I would absolutely rent this cabin again. Cozy and peaceful cabin with wonderful interior touches. A great place. This cabin was super cool with the rustic atmosphere and decor. Has pretty much everything you could need! Great location to downtown Manchester. We are hikers and this was right in the middle of a ton of great day hikes! We gave 4 stars instead of 5, due just to the description/pictures making you feel its tucked away in the middle of nowhere. When unfortunately a main highway is right in plain sight on the opposite edge of the pond. We were a little saddened by that, but would have been really upset if this had been a summer get away, due to the fact that you would definitely hear the traffic from the patio and open windows. All in all tho we would highly recommended this cabin! Thanks for the positive review Monica. When the cabin was built 25 years ago the road across the pond was light traffic and mainly local. Unfortunately due to urban sprawl and multiple ski center condo development projects the road is busy during the day and has also become a trucking route to service the demand. Night time during the summer with leaves back on trees is still pretty quiet. Please visit us again sometime. Die genaue Lage ist zwischen Bromley Mountain Long Trail / Appalachian Trail Zugang und Equinox Snow Tours. Wanderwege direkt neben dem Anwesen und auch Motorschlittenwege und Touren. Skifahren in Bromley, das 5 Minuten entfernt ist. Stratton ist 20 Minuten und Okemo 30 Minuten. Vermietung liegt auf 14 Hektar, umgeben von Green Mountain National Forest, Fisch und Boot auf Ihrem eigenen privaten 6 Hektar großen Teich. Minuten zu Manchester Performing Arts, High-End-Shopping im Einkaufszentrum Manchester Center. Todd Lincolns Hildene und Langlaufloipen in unmittelbarer Nähe. Auch Weltklasse-Fliegenfischen am Battenkill River ist sehr gut erreichbar sowie Tubing und Schwimmen. Der Steinbruch von Dorset befindet sich in unmittelbarer Nähe und bietet eine einzigartige Bademöglichkeit, die Sie in nur 15 Minuten erreichen. Kopieren Sie den Link unten in die Adresszeile des Browsers für den genauen Standort. Minimum stay is 2 nights and the charge is $225.00 per night weekends $205 per night for weekdays. For a stay of 7 nights or more the nightly rates are discounted. If there is no address provided on your traveler account we reserve the right to request a copy of your driver's license.